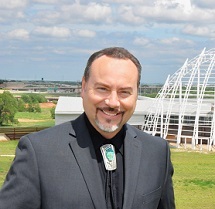 OKLAHOMA CITY, OK —Spring is a time of rebirth and the Summer season in Indian Country aligns with renewal ceremonies, so it is fitting that James Pepper Henry will become the Museum Director of The American Indian Cultural Center and Museum on June 19, 2017, breathing new life into this worldclass vision at this special time of year. Pepper Henry is an enrolled citizen of the Kaw Nation and also Muscogee (Creek). Pepper Henry has been involved in The American Indian Center’s development since 2004 when he helped inform the conceptual design. In 2007, as associate director of the Smithsonian Institution’s National Museum of the American Indian, he signed the Memorandum of Understanding between the two institutions, which created the possibility of a long-term ban, as well as collaborative programming opportunities. “I’m honored and excited to lead this newly established institution that will serve Indian Country and enlighten the citizens of Oklahoma and our great nation about the diverse heritages and cultural life-ways of America’s first peoples. When open, the Center will be a vital part of Oklahoma’s burgeoning tourism economy, attracting visitors from around the world,” says James Pepper Henry. Most recently, Pepper Henry served as Executive Director of the Gilcrease Museum, where he helped lead the successful $65 million Vision Tax extension campaign for the museum expansion and helped raise $27 million in additional support through the museum’s partnership with The University of Tulsa. Prior to the Gilcrease Museum he served as Director and CEO of the Heard Museum in Phoenix, AZ, increasing museum attendance by 58 percent and memberships by 150 percent. Pepper Henry served as Executive Director/CEO for a six-year tenure at the Anchorage Museum at Rasmuson Center, Alaska’s premier art, history and science institution, where he oversaw the completion of the museum’s $110 million, 80,000-square-foot expansion. His wealth of experience will greatly benefit the American Indian Center as construction resumes in the fall. In 2010, Pepper Henry oversaw development of The Smithsonian Arctic Studies Center, establishing a long-term loan of materials similar to what will be accomplished between The American Indian Cultural Center and Museum and The Smithsonian’s National Museum of the American Indian, including working with Ralph Appelbaum Associates on both projects. Pepper Henry is a graduate of the University of Oregon and a graduate of the Getty Leadership Institute in Los Angeles, CA. He is a board member of the American Alliance of Museums, a national organization overseeing museum accreditation, and a board member of the Western Museums Association. He serves on the Oklahoma Art in Public Places Oversight Committee and serves as a commissioner on the Greater Tulsa Area Indian Affairs Commission. Pepper Henry is also a board member for the Mvskoke Arts Association, a nonprofit organization that advocates for Mvskoke Arts and Artists.